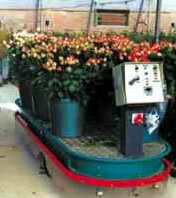 RobotiCar and IntelliCar are two Juran inventions that lighten the load of work in the greenhouse. These unmanned vehicles travel around the greenhouse along a predetermined path following an invisible buried wire. They are guided by sensors allowing them to navigate independently, even manoeuvring around obstacles, and are capable of performing a range of greenhouse procedures. With easy user control, they stop at desired sites for loading and unloading. Able to carry loads of up to 250kg, they automatically proceed to the unloading point when weight capacity is reached. The IntelliCar, in addition to its conveyance, tasking and load carrying benefits, also acts as a workstation. It can carry loads of up to 50kg, and it can carry out a variety of procedures at a height of up to 3.5 meters, including planting, tying, picking, and conveying. It is designed for stability even when extended or moving over rough terrain. Juran robotic greenhouse assistants improve work safety, convenience and efficiency.